Whisk together sauce ingredients in a small bowl. Heat the oil in a wok. Add the shallots and garlic until fragrant, about 1 minute. Add the Chinese celery and stir fry until slightly wilted and cooked down. Add the shrimp and stir fry 1 minute. Add the sauce. Stir fry until the shrimp is fully cooked. Serve over hot rice. *Soak about a 2x2 inch square of dried tamarind pulp in 1 cup of hot water. When it is cool enough to touch, squeeze out the tamarind over the cup and discard. Strain the remaining liquid into a cup and discard the seeds and pulp left behind. Chinese celery is sort of like a ramped up version of "regular" celery. It tastes like celery only more so. The stems are hollow unlike the celery you are mostly likely used to and can be woody. The trick is to focus on the leaves and the stems directly connected, it is the most tender and flavorful part of the plant. 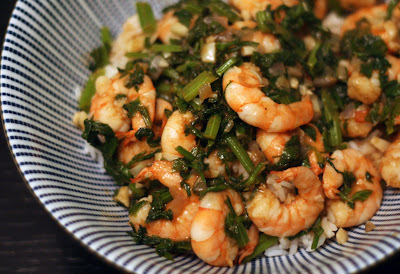 In this dish, the celery-riffic taste contrasts with the sweet-sour flavor of the tamarind sauce and the sweet shrimp to make for a dish that tastes complex yet comforting at the same time. Added bonus? The whole dish takes under 15 minutes to make.